I’m averaging about one committee meeting a week at the moment. One likes to be involved with ones community, and for me joining committees is the form this takes. Tonight it’s the choir meeting, we’ll be chatting about superannuation and to whom it is paid, and accompanists, and how much do you pay a children’s choir and are we ever going to have a website, that kind of thing. These meetings are very kindly hosted by the choir president in her beautiful home, so one wishes to bring a little something to snack on, to keep up the energy levels and to soak up the white wine. I generally forget, and grab some dried fruit or a bottle of wine as I head out the door, but today I’m organised and I’ve made crackers. There’s generally cheese at these binges, so I wanted something fairly unassuming and a bit dry. Cracker recipes seem to fall into two categories, flaky and cheesy, and dry and plain. I took a standard recipe and did this with it. The suggestion was for 250 grams of flour. I have a Thermomix, as I may have mentioned once or twice, so I put one hundred grams of whole wheat in the jug and Thermomixed it into flour. I actually put in the leaves of a couple of sprigs of rosemary too, but as you can’t taste them in the finished product, ignore that. Except to say that if you want a rosemary flavour you’re going to have to use a sprig longer than two centimetres. Then added a hundred and fifty grams of plain white flour. And a teaspoon of baking powder. Add sixty grams of Pepe Saya butter and zap it until the mixture resembles breadcrumbs. 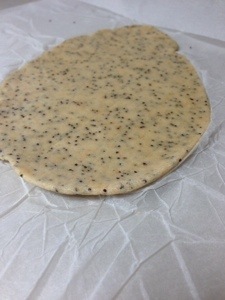 Pour in a hundred grams of cold water and two tablespoons of poppy seeds and mix on reverse speed about three until the dough starts coming together. Dump half of it it onto a sheet of baking paper, add another sheet over the top and roll that dough out until it’s really thin. You could put the other half in the fridge meanwhile. Or you could not bother. 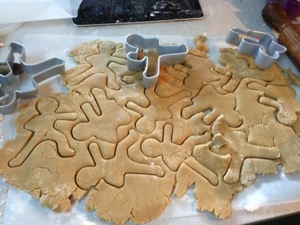 Cut out lots of little shapes and put them on a baking paper lined biscuit tray. Sprinkle with salt, this is where you use your fancy salt. Do the same with the rest of the dough. You’re only doing it in two batches because it takes up so much bench space when you roll it out thin. Bake at 160 degrees for about twenty minutes, until they’re just starting to brown. I tasted one and it was pretty much what I was after. I like the texture from the whole wheat, the poppy seeds and the ground salt. The flavour was suitably unassuming. Yet subtly moreish. 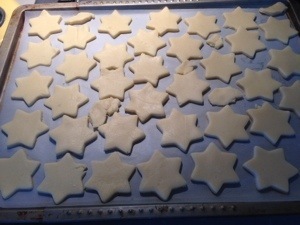 I am really enjoying making cookie cutter biscuits, they look so neat! I’m also really enjoying having a break from being a committee treasurer this year. But I believe all that will change next week, at the Womyn’s Collective committee meeting. I’m a sucker for being treasurer. Two failed concepts. What started me off was one of my regular trips to The Source. I needed dried fruit for the First Fruitcake of the season (since made, please someone come and eat some before I finish it off singlemouthedly), more of their dark maple syrup for the large amounts of caramel icecream my children are getting through and some five grain mix because I’ve run out of muesli. Well, dear reader, they had arrowroot flour. Apparently it’s ground up tapioca, but whatever. 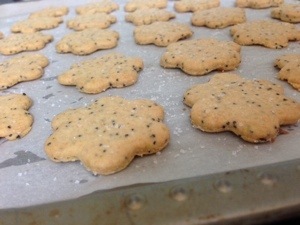 Arrowroot biscuits! Considering what a staple of Australian childhood the Arnotts Milk Arrowroot biscuit is, replica recipes are very thin on the inter webz. They’re possibly flooded out by the huge number of recipes for arrowroot biscuit toppings, because who would want to eat them plain, hey? In fact I couldn’t find any, and no, I didn’t look very hard. 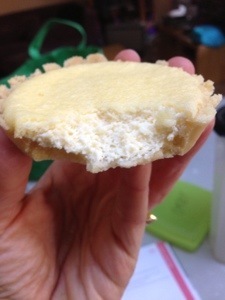 I did find an American arrowroot biscuit recipe, it looked a lot like a plain sugar cookie only with some arrowroot flour substituted for wheat flour. I had some vague idea that the Australian version has condensed milk in it, so I substituted a quarter of a cup of condensed milk for the egg that was the only liquid in the recipe. Here’s what I did. Cream 60 grams of butter (Pepe Saya, of course, I’ve still got about a kilo left) with a quarter of a cup of white sugar. Beat in a teaspoon of vanilla extract and a quarter of a cup of condensed milk. Beat in a cup of plain flour, half a cup of arrowroot flour, half a teaspoon of baking powder and a couple of grinds of the salt grinder. It makes a really white dough. You roll it out on a sheet of baking paper quite thin, and I’m pleased because I’m amassing quite a collection of cookie cutters and I love a chance to use them. 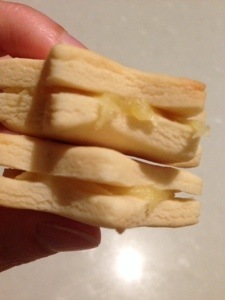 And cut biscuits look very neat. Bake in a moderate oven for not very long at all, maybe ten minutes? So they’re not anything like the Arnott’s biscuit. They’re a perfectly fine plain sweet biscuit, quite finely textured. I could possibly have reduced the sugar even more. I wanted to zap them up a bit, and I had rolled them quite thin, so it was time for my second failed concept. Salted caramel ganache. It’s everywhere, probably because it’s delicious. Back to the webz for ideas. Did you know that it isn’t a ganache if it doesn’t have chocolate in it? So this isn’t ganache, for a start. I only wanted a little bit, because I know what I’d do, and did actually do, with left over stuff of this nature. Eat it with a spoon. Spread some on toast. Then eat the rest with a spoon. At least I’m using cutlery. Keeping it simple, I put into the Thermomix thirty grams of Pepe Saya creme fraiche and thirty grams of caster sugar. I put it on Varoma temperature for fifteen minutes at speed two. The idea is to caramelise the sugar, it should turn brown. I had a peek after the time was up, and it was a sunny yellow. Put it on for another five minutes and convinced myself it was light brown. I didn’t want to burn it! I probably would have paradoxically been bolder (or more careless) with a saucepan and wooden spoon. I added thirty grams of Pepe Saya butter and a couple of grinds of salt, and zapped it until it was combined, only about five seconds. I poured it into a small metal bowl and bunged it in the fridge, trying to forget about it. It did solidify into something satisfyingly spreadable after a few hours, so I spread it on some of the biscuits. Wow that stuff was delicious. Very smooth, I’d go so far as to say unctuous. Slight tang taking the edge off the sweet from the creme fraiche. Just enough salt. I couldn’t kid myself, it wasn’t caramel, but it definitely was butterscotch. That’s why I’m going with “butterscotch cream”. Can I make up my own name? I’ll work on it. It did demonstrate that the caramel I’m using in the icecream is a faux caramel, getting its colour from brown sugar and maple syrup. I don’t want to mess with that, it’s perfect. But I will really have to have another crack at this not ganache. After I’ve worked the first lot off at the gym. One of the many things we learned while camping is that marshmallows aren’t as robust as they look. We brought along a couple of jumbo sized packets to roast over the campfire, but only got through half a packet before the total fire ban overtook us. We carelessly tossed aside both the opened and unopened packets and discovered as we were packing up that the contents of both packets had coalesced into one giant, ungainly confection. Waste not, want not. It looked to me like I was going to make Iced VoVo slice. I was a bit stymied by the children never having heard of an Iced VoVo, what with their organic home baked hemp swaddled upbringing. 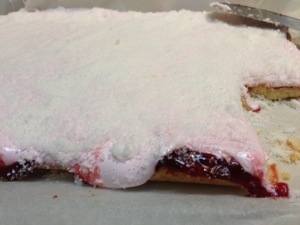 I explained that it was a biscuit topped with jam, marshmallow and coconut. “Sounds weird”, they said as one. You know I’m not an easy person to deter. First to find a suitable base. I chose Tish Boyle’s sweet pastry crust, and it goes like this. Place one and a third cups of flour and 125 grams of cold butter in the Thermomix or inferior simulacrum. She also suggests a third of a cup of white sugar, but this is going to be pretty sweet with the jam and marshmallow, so I only put in two tablespoons. Zap it until the mixture resemble breadcrumbs. Add two teaspoons of cold water and a large egg yolk and zap again. Press into a lined roasting pan and bake for twenty minutes, until just starting to brown. What to do with the marshmallow? I think I had about 200 grams in the opened packet. I put it in the Thermomix. I tried just chopping it, but that just made more mess. So I put the temperature up to fifty degrees, the speed up to ten and whipped it for an amount of time that escapes my memory. Five minutes? Possibly ten? I peeked in the top and stopped it when there was a light pink shiny thing going on in there, instead of multicoloured glop. I spread the cooked slice base with the last of my first experiment with strawberry jam, the one that wasn’t sweet enough and was too acid. It has featured in a few normal jam slices, but this may be its finest hour. I squodged the warm marshmallow on top of that, it was cool enough to spread out with my fingers. There may have been a bit too much marshmallow, if there is such a thing. 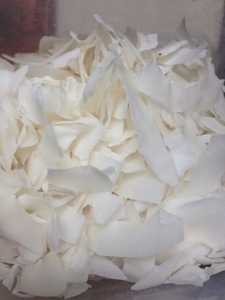 I then pressed a whole lot of desiccated coconut on top, I felt that it needed a lot for texture and flavour. It did sink in quite well. You want to wait until it’s well and truly cold, maybe even refrigerated, before you cut it because that marshmallow is STICKY. The hordes didn’t really like their first piece. Outside their experience. Five to ten minutes later they wanted another bit, just to make sure. And now it’s all gone and they’re clamouring for more. Lucky I’ve got a whole ‘nother packet of marshmallows with issues. The first time I had this request from the Horror it was half an hour before we left for choir, so as I always strive to be a good parent I told him to go jump in the lake. Having learned this lesson I’ve been able to ratchet the request back to a much more reasonable forty eight hours prior. This even enables us to work out what baked good he’d like to take. He’s rather enamoured of something I had a crack at yesterday, namely mini coconut cakes. As they’re almost all gone, I’ve just made another batch. I’ll have to hide them so he has some to take in tomorrow morning. First, locate some coconut. I like to get mine in flake form from The Source, in Balmain. 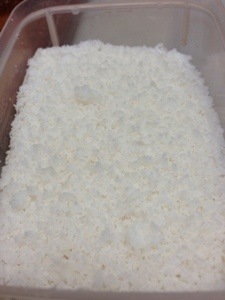 A quick visit to the Thermomix turns it into a very fresh tasting desiccated coconut. One also needs coconut milk. I was able to persuade myself that the ancient tin dug out of the back of the cupboard contained something still edible, no really, it was fine. I tasted it and everything. Cream together ninety grams of butter with three quarters of a cup of sugar. Add a teaspoon of vanilla essence and an egg and cream some more. 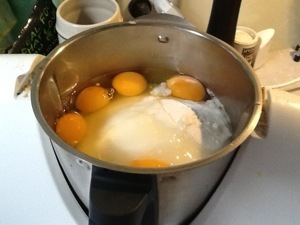 Add an egg yolk and incorporate that also. 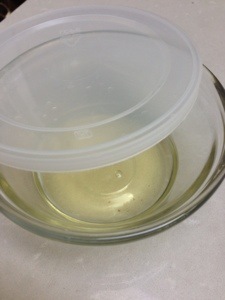 I found some nifty little glass saucers with lids for keeping just such a thing as left over egg whites. Was it at Peters of Kensington? I can’t remember. But I used some egg whites that had been kept this way for two weeks in the fridge only yesterday, they made excellent meringues. Add three quarters of a cup of flour and beat that in. Add a third of a cup of coconut milk and the zest and juice of half a lemon and beat that in. Add a third of a cup more of flour and a third of a cup of desiccated coconut and beat that in. 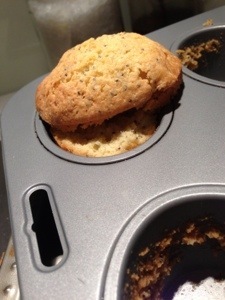 Spoon into greased mini muffin tins. Or these saucer shaped things that I think I inherited from my Nanna. Bake at 160 degrees for about twenty minutes, or until turning golden on top. Don’t they come out a cute shape? 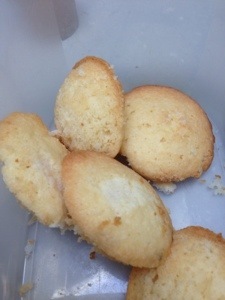 I’ve adapted the recipe from Coconut Tea Cakes in the ever reliable Good Cookie, by Tish Boyle. I have modified a few things. I added the lemon, I love citrus and coconut. I’d like to try lime, but it’s sometimes a bit funny when you cook it, especially the zest. The recipe book suggests sweetened shredded coconut, but I spit on that suggestion. Why can’t Americans sweeten things as they go, or would it be too shocking to see how much sugar they eat? Or are they just trying to use up all the corn syrup? There’s also a fancy frosting to go on top, but I’m not bothering. Too hard to store. Of course what will happen is that The Horror will take these in tomorrow morning and some kid will have brought in Krispy Kremes. Then the Horror will eat half of the coconut cakes himself at recess and make himself some friends with the other half. Whatever, I’ve done my bit. The housewife’s honour is satisfied. You know I don’t usually do this kind of thing. The whole giving up stuff, I don’t get it myself. Can’t you just have bit less coffee, wine, sugar, white bread, self loathing? Why do you have to give it up entirely? Moderation in all things, I always say, but for many people it doesn’t appear to work. Me, if my trousers are getting a bit tight, I lay off the cake and get a bit more exercise. I don’t go out and buy a bigger size. And I don’t pick something to flagellate myself with. Don’t we all know what food is sometimes food? But I’m surrounded by people who seem to feel better if they give up something entirely, if only for a month. I have a relative who has given up sugar, and it has been a really big thing for him, a real struggle and he has managed to lose a lot of weight this way. 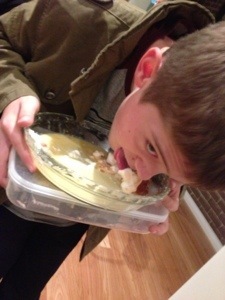 I’m very proud of him, because I know how much he loves the sweet stuff. I have watched him eat a large amount of biscuits at a sitting, so I guess moderation isn’t the best option for him, it’s all or nothing. So I wanted to make him something tasty that he could have with a cup of tea that wouldn’t have him falling off the wagon. There’s a few variations of this on the webz, and I didn’t think it would hold together. You take a couple of large bananas that have seen better days. You mush them up. 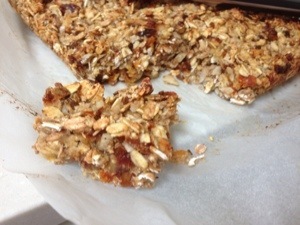 You mix these with two cups of oats, or in this case, five grain mix which is even better. 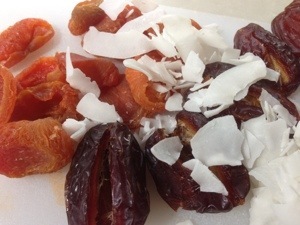 You add in about half a cup of chopped other tasty bits and pieces, I chose dried apricots, dates, almonds and shaved coconut. Chopped in the Thermomix, naturally. Flavours of your choice, in this case a teaspoon of cinnamon, a teaspoon of vanilla and the zest of an orange. I think the orange may have been overdoing it, but heigh ho. Press the lot into a lined square cake tin and bake for about half an hour. Pickle me grandmother, it does actually hold together. I’d wait until it was cold before cutting it up. It was pretty good in a very hemp lined tree hugging way. Sweeter than I would have expected, that would be all the fruit. But I believe sugar from fruit doesn’t count, it’s one of those regimes with fairly arbitrary rules, based, as they always are, on the work of an American guru. I don’t think you could eat too much of it anyway, your jaw would wear out. But the main thing was that it tasted good with a cup of tea. Mission accomplished. I started something in 2002. Something of which I in no way understood the ramifications. I sent my son, the incipient Moose, to preschool with gingerbread men on his birthday. The advantage of a winter baby is that you get a few months to see how the whole birthday thing works. Where the parties are held, how many are invited, do the parents stick around, that kind of thing. There was also what to do on your actual birthday, and that was to bring in something delicious to eat to share with the class. Through close observation I noticed that the preschool staff were least keen on a whole cake. You have to work out how many kids there are, cut the cake in that many pieces, find plates, clean up cake slice stumps after. It’s a palaver. To earn brownie points you work out for yourself how many are in the class, add teachers and admin staff, deduct the allergy kids, and send in something in individual portions. Like cupcakes. Or, in our case, gingerbread men. My kids aren’t that keen on cupcakes. 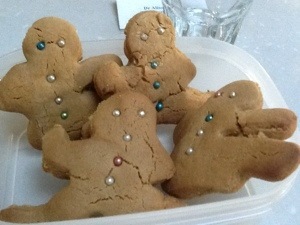 Little realising that I’d let myself in for a lifetime of gingerbread man making. The actual recipe isn’t hard, I’ll give you that in a minute. It’s the converting them into men that’s a very very tedious job, thank goodness I only have three kids. The Moose is at a stage where it’s lame to bring in cake for the class, but he won’t say no to a box of Snickerdoodles. At a girls school baked goods are never lame, but the Muffet now prefers to bring in a couple of trays of raspberry slice. It’s only the Horror from Outer Space who still needs gingerbread men. Only, a few years ago I found these cutters. So now they’re ninjabread men. I’ve also seen zombie cutters, but that isn’t fun to say and they just look like you’ve been careless cutting out your men. I’m sticking with the ninjas. “How many do you want?” I really have to ask, not wanting to know. “We’ll, there’s everyone in my class, that’s twenty five, and my friends who aren’t in my class, and my teacher and my bassoon teacher and I have Art, so the art teacher. And I’d like to have two. What about fifty?” Shudder. From much experience I know that the recipe reliably makes twenty four, so to be on the safe side I’d better make a triple recipe. The KitchenAid is up to its apricots in it, if you’ll excuse a Bazza McKenzie phrase. I’ll give you the amounts for one recipe. Cream together 125 grams of butter with half a cup of brown sugar and a tablespoon of ground ginger. Beat in half a cup of golden syrup and an egg. Mix in two and a half cups of flour and a teaspoon of bicarbonate of soda. Press the dough into a ball, wrap it in Gladwrap and stick it in the fridge while you go pick up the Muffet from school. Upon your return, place a large sheet of baking paper on your workbench, slap the dough on top of it and put another piece of paper on top of that. It’s a fairly sticky dough, but you don’t want to work more flour into it. Roll it out to about a centimetre thickness. Then you start stamping out those suckers and putting them on a lined baking tray. 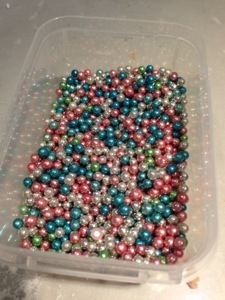 The bit I really regret starting is decorating them with silver cachous. Two for the eyes and three for buttons. Fifty times. I managed to bake one sheet and get another in the oven before I had to pick up the Horror from basketball. One more as I made him and his sister dinner, before I went up to the Moose’s school to listen to the Languages Poetry competition. Don’t ask. But he was very good, I was very proud of his Latin pronunciation and the way he didn’t pace a twenty metre track as he recited like he did while practicing at home. He didn’t win. Then another sheet before bed, and we got up to fifty. I still have some dough left to make some more, and I will, really, I just need a day off from those eyes. Those many glittering eyes. Anyone in the Inner West know that the the best ricotta cakes come from Papa’s Pasticceria. On weekends they have a line out the door and down the street of slavering hordes buying them as fast as they come out of the kitchen. Actually I don’t know if they are the best, I’ve never tried anyone else’s version. They are excellent. 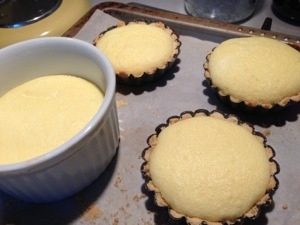 I knew I couldn’t replicate them, not with a week’s notice anyway, but I could have a stab at the ricotta tarts. These are what you have if you just want a taste of ricotta cake. Not as widely known as the cake, I’m surprised they sell anything other than the cake at the weekend because the surging crowds rather obscure the long glass counter. You need to be in the know. I am, being a local, so I braved the throng last weekend and procured some for research purposes. Hmm, pastry quite short, maybe some cream? And there are many recipes about for ricotta cheesecakes, I might just take an average. Here’s what I did. Pastry. Into the Thermomix chuck 50 grams of cold Pepe Saya butter, two tablespoons of sugar, two tablespoons of cream, a cup of flour, a teaspoon of baking powder. Zap. In a few seconds you’ll get a jug full of damp crumbs. 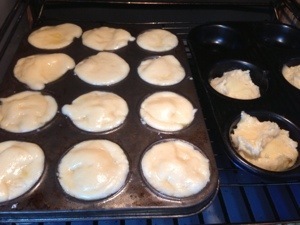 I pressed these into fifteen fluted Bakers Secret tart tins, the ones with the removable bottoms. There was enough for sixteen, but I’ve lost the bottom out of one of them. Surprised its only one, really. Baked these for a touch over five minutes, until they just started to colour. Cheesecake filling. Bung into the KitchenAid bowl an egg and two tablespoons of sugar. Beat until the stuff goes white. In another bowl mix together 125 grams mascarpone, two tablespoons of cream, 250 grams of fresh ricotta and a teaspoon of vanilla extract. You can do this with a fork. The old skills remain. 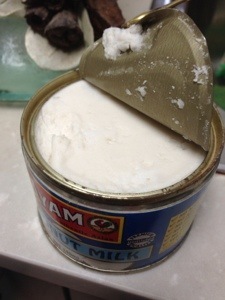 Fold the cream mixture into the egg. Spoon into the tart shells. Bake at 140 degrees for about forty minutes, I like to go easy on the cheese. Take it out when it’s just starting to tan a little around the edges. The cheese filling will be puffed up, but will subside once it cools. I would recommend de tinning them before putting them in the fridge, though they’re pretty fragile at this point. Oh, they were good, all right. “A lot like custard tarts”, remarked the Moose as he embarked upon his third. The pastry was quite fragile, but melted in the mouth. The whole lot was just sweet enough. The ricotta filling was light and fluffy, quite a bit lighter than Sam Papa’s version. And that’s what the Horror couldn’t get past. He couldn’t even finish one. “It just isn’t right”, he said, handing me half. “I can’t forget that they’re not Papa’s”. Well, he’s right, they’re not. I need a tougher pastry and a creamier filling. Having said that, I’ve just sampled one two days later and they age in the fridge very well indeed, as do Papa’s. 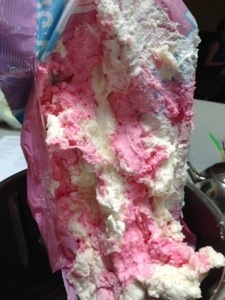 The pastry is still fresh and delicious, but not nearly as fragile. The filling has compacted a little. I may see if the Horror can bring himself to try another one. But you know what? Papa sells these for less than two dollars each. I have an excellent tart recipe for my next afternoon tea extravaganza and I’ll buy the Horror his birthday cake from the Pasticceria. My Thermomix had its own holiday while we were away. It went to visit a friend and made a variety of beverages and butter and many other things that I’ll find out about next time I barge into her house and demand she makes me a coffee. I missed it as soon as I got home, I had to go and retrieve it and immediately make porridge and yoghurt and raisin bread in it. Not all at the same time. Over several hours. 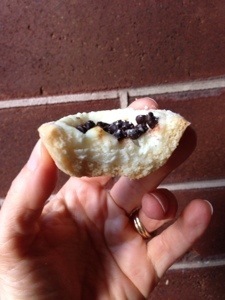 I know I’ve discussed friands before, but they’re just one more thing that’s a lot easier in the Thermomix. The order is a little different to doing it by hand, as are the ingredients. You put in the jug 200 grams of white sugar and 110 grams of blanched almonds. Zap it, zap it good. Probably about speed eight for a good thirty seconds. Rub the mixture between your fingers after it stops, if you want it finer go another thirty seconds. It depends whether you’re using caster sugar or regular, or slivered almonds. You want really fine. Tip this mixture into a bowl. Put 125 grams of sweet butter into the jug and melt it at 60 degrees and speed two for about three minutes. Actually, I got this completely the wrong way round today, I did the butter first. I had almond meal, last time I went up to the IGA that’s all they had. I forgot about turning the sugar into icing sugar. So after the butter had melted I put in the two hundred grams of sugar and kept it at sixty degrees for another three minutes on speed three to dissolve it. Then you put back in the sugar and almond mixture, plus three quarters of a cup of plain flour, half a teaspoon of baking powder, three eggs and your flavouring. I’m doing orange and poppyseed because blood oranges have just come in. I want to make something with the insides of the blood oranges, so in pursuit of my snout to tail philosophy when it comes to citrus fruit I’m saving the zest. Ignore the instructions for doing citrus zest in the Thermomix, you need a Microplane. You can’t Thermomix everything, you know. I tend to use a lot of citrus zest, so the zest of twelve blood oranges should disappear quickly from the neat little glass dish I’ve stored it in. 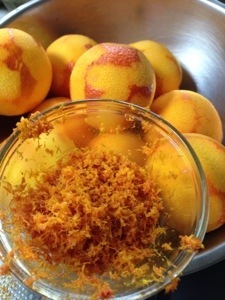 You want the zest of two oranges for this recipe, it’s about a tablespoonful. 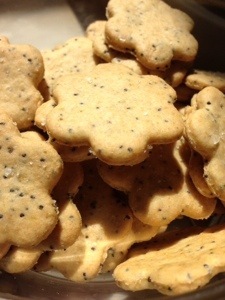 You also want a tablespoon of poppy seeds, put those in the jug too. Have I got everything? 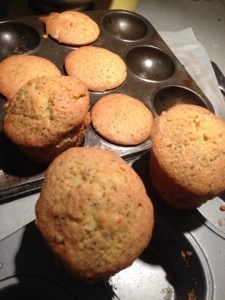 Sugar, butter, almond meal, flour, baking powder, egg, orange zest, poppy seeds. All right. I zapped it on speed eight while looking through the hole in the lid, stopping when it looked well and truly mixed. I did use the friand tin this time, they do look a lot more appealing in that shape. As you only get six to a tin I also used a patty cake tin inherited from my Nanna. I put the tins in the oven for a couple of minutes, then cut off a chunk of cold butter to grease them with. I’ve tried the spray oils and they don’t work as well as butter. You have to be a bit careful releasing the friands, wait until they’re cool and maybe run a knife around them if you can’t ease them out. I overcooked them a little because I like the tops crunchy. Not that I get to eat them. They really are quite a bit lighter in texture done this way than by my old fashioned manual labour way. I going to have to think of some other flavours than orange and poppyseed and pistachio. If I did hazelnut and cocoa powder that would be a Nutella flavoured friand. Now there’s a thought. Wow, stream of consciousness invention right there. One problem with conducting a blog in which you occasionally mention food preparation is that people form certain expectations about your abilities. So when you’re invited for dinner and you offer to bring dessert, it might be a wise idea to bring something you’ve actually made before. 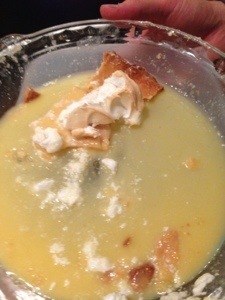 Well, I have actually made lemon meringue pie before, but I wasn’t happy with it. This time, I was definitely pretty happy with the crust, though it was a little over cooked. I had a lot on on Saturday, I stopped concentrating. Anyway, it was three tablespoons of brown sugar, two tablespoons of crystallised ginger, zapped in the Thermomix. You don’t have to use ginger, but I really like it with lemon. 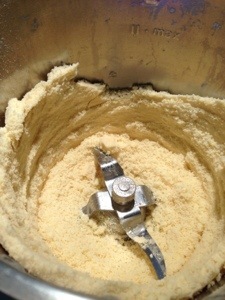 Add 150 grams of cold butter, two cups of plain flour and three tablespoons of cold water. Zap that in the Thermomix. 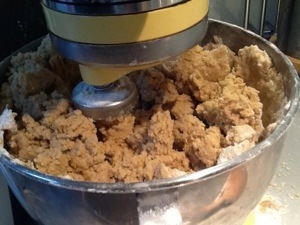 It will turn to a crumb like substance first, but should start becoming more dough like after ten seconds or so. If it doesn’t, add another tablespoon of water. Don’t go nuts with the water, a wet dough will make somewhat tougher pastry. You just want it to hold together. Squash it into a ball, wrap in Gladwrap, then put it in the fridge for half an hour or so while you melt the chocolate for the topping of the choc mint slice you’re making as a backup. Roll out the pastry, then gently lift it into a pie dish. 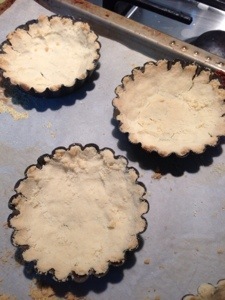 I dust the pie dish with a bit of flour, but as I use a glass pie dish I’ve not had a shortcrust stick to it. I had a few off cuts left, so I also made some mini tart cases. Cover it with baking paper, load it up with some barley you found in the back of the pantry that’s past its use by date and is looking a bit dubious and bake it at 180 degrees for about ten minutes. Wade out into the back swamp and dump the barley in the compost, remove the baking paper (once you’ve made it back to the kitchen), then bake for another ten minutes. You just want it golden. I really must get myself some pie weights. I don’t think I’ll trouble you with the filling recipe. There seem to be a few schools of thought on the filling, and I foolishly went with the corn flour and water version. You whisk together cornflour, water, lemon juice, lemon zest and sugar over heat (or in a Thermomix) until it boils, then whisk in three egg yolks. You pour that into a bowl and refrigerate it. It thickens up quite satisfactorily, at which point you spoon it into the pie case. 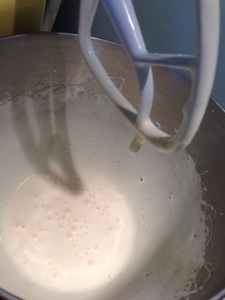 Then you do the meringue, which is whisk three egg whites and a pinch of cream of tartar until soft peaks form. Pour into the KitchenAid while it’s still going a third of a cup of caster sugar and you’ll see the meringue go all glossy. 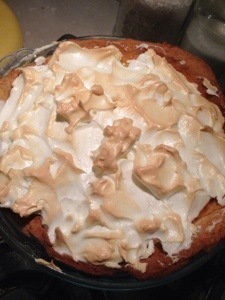 Spoon it over the cold pie, then back into the oven until the top of the meringue just starts to brown. Shall I cut a long story short? After an excellent meal and much nagging by the Horror I cut into the pie to discover it was more of a meringue pie with lemon sauce. The lemon filling had completely liquefied. I probably should have put it in the fridge. Oh, it got eaten. But, embarrassing! Especially as my hostess had been calling me Nigella all evening. So I’ve been thinking about trialling different filling recipes to put into the leftover tart cases. But the kids have sneaked them all and eaten them unfilled. They’re just going to have to put up with eating different lemon meringue pies for dessert this week. How I make them suffer. It’s fresh, it’s home grown, it’s possibly organic, it’s a bag full of backyard oranges. I do love being gifted raw ingredients, so how could I knock back a bag of oranges. A very large bag, full to the brim of thin skinned, sweet, juicy, I’m guessing Valencias. We have eaten quite a lot of them. Some of them went into an orange and passionfruit syrup. Some of them succumbed to the blue green algae. But I still have a bowl full left, and I’ve always wanted to try an orange and almond cake. There’s actually a recipe for it in the Thermomix cookbook. I’m deeply suspicious of most of those recipes, even more so as this one claims to be fat free. What a lot of nonsense. It contains 250 grams of almond meal, it isn’t even slightly fat free. 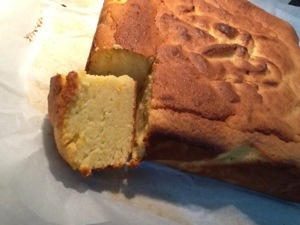 So I compare it to the orange cake recipe in the Stephanie Alexander Cooks Companion, and it looks fairly believable despite having only half the eggs. Here’s what I did. 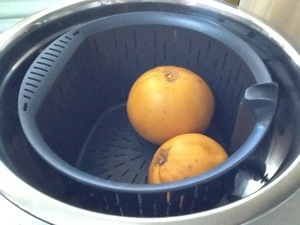 Take two large, or three small oranges and bung them in the Thermomix steamer basket. Stick a litre of water in the jug and cook those babies for forty five minutes at Varoma temperature on speed three. The Stephanie Alexander recipe suggests gently boiling them for two hours, so I’m quite glad I’m not doing that, given my attention span. I’m quite capable of going out to buy cucumbers and returning to find my kitchen a smouldering ruin if I did that. See, I’m saving money with the Thermomix. They’re very soft after forty five minutes, I’m happy not to cook them further. You’re supposed to cut the oranges open at this point to hunt for pips, which I dutifully do and don’t find any. Bung them into the emptied jug and add on top 250 grams of almond meal, 250 grams of sugar, a teaspoon of baking powder and some eggs. The Thermomix recipe says three, Stephanie Alexander says six. I compromise on five, as that’s how many I have left in the box. See how full the jug is, yet when you zap it on speed seven for twenty seconds the oranges are pulverised and the whole lot is completely mixed. Pour it into a lined cake tin and bake it at 180 degrees for forty five minutes to an hour. The skewer test doesn’t really work on this type of cake, so when I pull it out after fifty five minutes for a sample it’s still fairly damp inside. 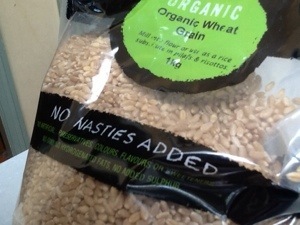 Or moist, if you prefer. From what Stephanie says, it should be, but I’d rather it wasn’t. I put it back in the oven for another half an hour on 150 degrees and do actually go and buy cucumbers. It’s certainly dryer inside when I get back. I do like the flavour, but not so sure about the texture. I might try reducing the eggs next time. Or possibly adding some flour and more baking powder. I’d like it lighter. But for there to be a next time, this one needs to be eaten first. Lucky it’s fat free.